Male rompers are happening, and no, it is not okay. This trend has quickly been gaining media attention, and I have to say, this could be worse than the mullet. Our society is moving towards androgynous fashion, and this is all fun and games until the men that I am supposed to be attracted to are walking around in dresses. It’s a domino effect people, and this is the first domino that will end them all. Is it a romper designed for men? Sure. But it’s also pretty damn comfortable, and it may just be the start of a fashion revolution. Pretty damn comfortable? Since when was fashion about comfort? Oh right, never, and it’s not about to start becoming about comfort now. Or maybe it is because the Kickstarter asked for a measly $10,000 and has, with 25 days to go, raised $303,166. 2,623 backers have come together to give these contributions, which means that on average each person contributed $115.58. What is even more disturbing is that when I started researching for this piece, I discovered that our very own Cam Newton was, in fact, the God father of this trend. 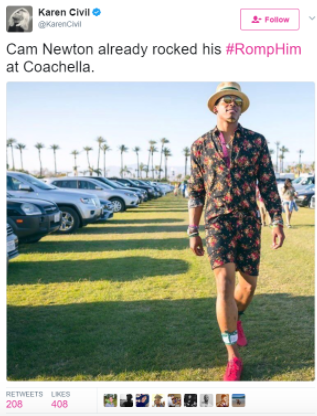 He wore a male romper to Coachella, and social media will never let us forget now that #RompHim has started trending. I originally felt like this phenomenon had to be LA’s fault. 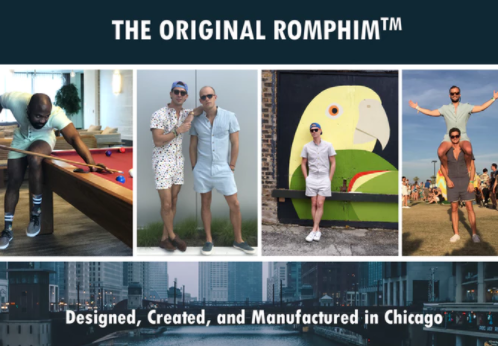 However, the innovators behind male rompers are actually from Chicago, IL, which makes this entire phenomenon’s existence even more confusing. Male rompers are now being created for the ONE warm month a year in Chicago? Male rompers are now taking over the internet, and various celebrities (cough Andy Cohen) are digging up photos of themselves from years before to prove that they were ahead of the curve with the male romper trend. Whether it is a meme, a hashtag, or a photo, male rompers are taking over the internet. Time will tell if they will take over the streetwear market, and thus the demise of the well-dressed male. The Rock and Tom Hanks Run for President SNL Skit | Is Alex Jones’ Infowars and Prison Planet Traffic Down Due to Google Fake News Fact Check?